A few weeks ago, I shared a finished Plus Quilt and said I was making another identical quilt so the set can live on the bunk beds at the Island House. I finally finished the Plus Quilt 2.0... and just in time too - the boys are going to open the Island House this weekend and will be taking these quilts with them. Just like its twin brother, this Plus 2.0 is quilted with a soft, big meander in Auriful Dove thread. And I used leftover binding strips in greens. And just like that, item number 3 on my Q2 FAL list for 2016 is done! Yay! Linking up at Crazy Mom Quilts for Finish It Up Friday and at Celtic Thistle Stitches for TGIFF. After making the strawberry and pineapple mini quilts a little while ago, there was still a little bit of space on the kitchen wall and most "experts" say things should be done in 3s when you decorate so I decided to make a small apple. Just like I did for the strawberry, I used red and green scraps and made the background with Kona White. The binding is an old print I've had in my stash forever! For the quilting, again, like I did for the other two minis, I stitched paisleys in the red squares, dense back and forth lines in the brown, a small feather in the green leaf and pebbles in the background. It finishes at about 18" square. And I'm happy to report that this is finish number 1 on my Q2 FAL list. Linking up at Crazy Mom Quilts for Finish It Up Friday and at Fleur de Lis Quilts for TGIFF. A little while ago, I came across this tutorial by Crazy Mom Quilts and thought it was such a good idea, I had to try it. My scrap bins are overflowing and I really need to make something with them and we repainted the dining room recently... so, of course new wall art was in order. I made a quick trip to the Michael's near my house, bought a few canvases and some Modge Podge and immediately got started. I selected blue and orange scraps to go with a new quilt I'm working on and which will go on the wall in the dining room. I just love how they brighten up the dining room. I've gotten so many compliments on my wall "art", I'm now getting orders! :-) My daughter also wants to make some for her bedroom so I'll be making more of these this weekend. Have you used scraps for things other than quilts or sewn accessories? Let me know in the comments - I would love to get more ideas on using up fabric scraps. Linking at Crazy Mom Quilts for Finish It Up Friday and at Faith & Fabric for TGIFF. I was pretty successful with my Q1 list - I managed to finish 5 items on my list of 6. I was so productive and focused, I figured I might as well sign-up for Q2! This apple mini is pieced and basted so all that's left is the quilting and binding. Pretty sure I can have this one finished for the end of June. I made this improv top during the February Mighty Lucky Challenge as a practice piece. I'm still not sure I like it, but I will quilt it and see where that takes me. This is the second Plus quilt I made for the bunk beds at the Island House. I have since basted it so I now need to quilt and bind it. This quilt was designed by the very talented Cheryl of Meadow Mist Designs. It's going to be a wedding present for one of my employees and the wedding is this summer, so June is a good deadline. 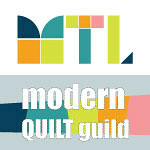 Back in March, I attended a Libs Elliot workshop with fellow members of the Montreal MQG. This is all I managed to piece during the workshop. So between now and June, I have to finish piecing the top, make a backing, baste, quilt and bind. Anna is my daughter-in-law and she's a hair dresser who's been doing my sweetie's hair for free. And she's also the sweetest girl in the world. I think she deserve a quilt so her chevron quilt is going on the list. I'm going with Kona solids in blues and whites and an orange binding. A few months ago, I bought a kit on sale from Craftsy. It's a V and Co pattern and ombre fabrics from Vanessa Christenson. I've got everything cut so I'm planning on piecing, basting, quilting and binding before the end of the quarter. I know this is a pretty ambitious list, but I feel good about it! Every year, the Montreal MQG chooses a charity and some of our members participate in the making of quilts for our charity. We participated in the MQG Charity Challenge this year of course and our quilt was hanging at QuiltCon West 2016 which was a huge thrill. Our president, Stephanie, of the Queen of Wands Studio blog, managed to get some free fabric from Camelot Fabrics so I volunteered to make a quilt for our charity. I made a bunch of off-centre square in a square blocks and added white sashing to only two of the sides of each block. I chose a random layout and sewed the blocks into a top. It went together super quickly! I quilted it with my walking foot - nice soft wavy vertical lines. The quilt is nice and soft! I used a gorgeous orange print for the back and made it big enough by adding a band a scraps. The finished quilt is about 48" x 72"... Perfect for snuggling under on the couch! 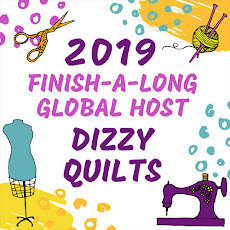 Linking up at Crazy Mom Quilts for Finish It Up Friday and at Quilting is More Fun than Housework for TGIFF!